BANGI, 12 August 2014 – Public Universities should adapt their curriculum to enable their undergraduates to understand global economic changes that impact on the job market in the country. 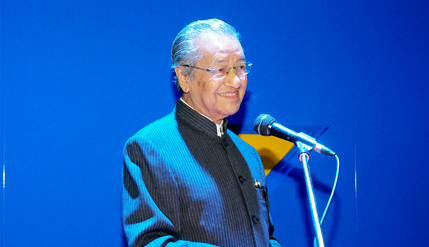 Former Prime Minister Tun Dr Mahathir Mohamad said academicians and researchers must appreciate the changes taking place in the market place and cast aside narrow nationalism. Delivering his keynote address onReshaping Academia In The Rise Of The Emerging Markets, at the Emerging Markets Business Conference in The National University of Malaysia (UKM) here yesterday, Dr Mahathir said universities should act soonest because the changes are beyond the country’s control. His address marked the opening of the conference at the Persada Canselori concourse which featured three other speakers, including UKM Vice-Chancellor Professor Datuk Dr Noor Azlan Ghazali. Academics and researchers, he said, needed to be more familiar with the fast dissemination of information which is not limited by boundaries as was the case 20 years ago. “To understand and absorb knowledge, we need to master at least another language apart from the national language. In the golden age of Islamic science, Muslim scholars studied Greek and Latin so that they could publish books of knowledge in Arabic. Eventually, Arabic became the language of the learned duringthe golden age of Islamic civilization,” the elder statesman said. Arab scientists then made discoveries and innovations in science, technology, medicine and astrology which were then picked up by Christian monks in Europe which was then going through the dark ages. The Christian scholars had to learn Arabic and Persian. Western researchers eventually made follow-up discoveries that became the foundation of science during the Renaissance in Europe and now they dominate technology. “Now that scientists in the West mastered technology, we also need to learn their languages. It is important that we learn from others and avoid becoming too constrained in the use of the national language. If not, we will be left behind,” he said. Dr Mahathir said it was the responsibility of universities to turn out employable graduates to face an increasingly competitive job market. UKM staff and and students including exchange students from Poland, Mexico and the ASEAN countries attended the conference. Chief Executive Officer of the Small and Medium Enterprises (SME) Corporation Malaysia Dato’ Hafsah Hashim and Emkay Group founder and advisor Tan Sri Mustapha Kamal Abu Bakar also gave talks at the conference.